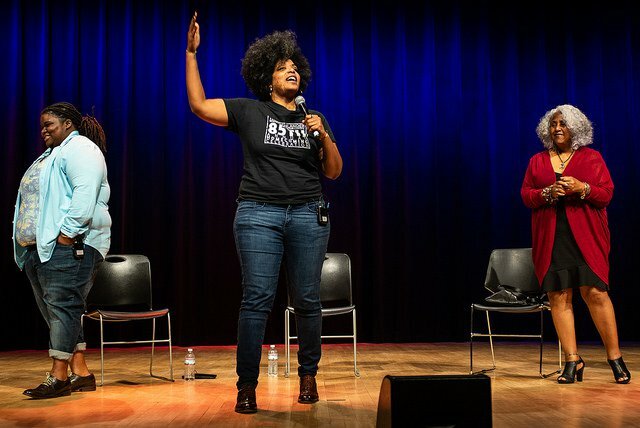 Ash-Lee Henderson, M Adams and Makani Themba speaking during the opening plenary of the CommonBound summit in St. Louis on June 22 2018. Credit: Flickr/New Economy Coalition. All rights reserved. In late May of 2018, the Buffalo city council agreed to a strategic plan that gives residents on Buffalo’s East Side a meaningful voice in how their neighborhood will be developed. The council transferred up to 20 vacant lots to the Fruit Belt Community Land Trust, a nonprofit that will manage the property and keep housing prices affordable for those who need it most. They also agreed to give nearby homeowners the option to buy other vacant parcels. This victory was the result of years of community organizing by local residents who were determined to take action in the face of the gentrification of their neighborhood. The long-term goal is “development without displacement,” attracting new jobs and building new housing but not at the expense of the existing residents who call the Fruit Belt home. The Fruit Belt Community Land Trust is just one of thousands of stories of people who are organizing to build what many call “economic alternatives.” But lots of people working on these “alternatives” in the US “new economy movement” reject that framing because they aren’t interested in staying in the margins. Instead, their goal is to transform the system, not create a niche alternative for a small number of people. The new economy wants to be the economy, but how? Modern capitalism is resilient, and it has proven effective at incorporating revolutionary efforts into its logic. For example, the fair trade movement started with grand aspirations to radically transform the nature of global trade. Despite fair trade’s decades of tremendous growth and meaningful impact for several hundred thousand farmers and tens of thousands of artisans, global trade remains uneven and unfair. Nations with the most economic and military might set the rules of engagement, while producers and farmers in poorer nations have little leverage to fight back. Meanwhile you can find fair trade products in just about every grocery store in America. Modern capitalism absorbs these trends by passing on the cost to consumers as more expensive options in a sea of products. Chocolate bars with cacao organically farmed by cooperative worker-owner farmers earning a living wage? They cost five dollars at Whole Foods (which is to say, Amazon who own the chain). Chocolate bars produced using child labor, with palm oil harvested through the destruction of rainforest habitat? They can be bought for a dollar fifty by a gas station attendant working three minimum wage jobs to support her family. The fair trade story demonstrates that going mainstream is not enough. We have to build enough power to change the fundamental architecture of the economic system. Folks in the new economy movement use this principle of system change as a lens to evaluate potential strategies and policies. Take universal basic income (UBI)—a policy in which every person receives a monthly check from their government large enough to cover their basic needs. Although it’s an idea that can be traced back to the 16th century, UBI has gained traction in the past few years as societies consider the impact of advanced automation, a.k.a. robots taking our jobs. Supporters argue that UBI is needed to ensure that the masses have enough money to afford a middle-class lifestyle and businesses have enough customers to buy their products. In a future where it's cheaper to automate most jobs than hire a human being, the UBI is held up as a solution. It’s fascinating that this position is being debated on the left, right, and in-between. However, the point is not to save capitalism but to usher in a new system that values the dignity of all human beings, no matter their income. Yes, automation is replacing many human jobs. It’s actually been happening for quite some time. The stakes just seem higher now because the social safety net has been decimated by years of disinvestment and the scarcity of good union jobs. The problem isn’t actually automation, it’s about who owns and controls technology. As many of UBI’s supporters on the left ask, what if the gains from technology weren’t captured by a small number of capitalists but the workers themselves? Without changing the ownership and governance of the economy we risk not changing much at all, even if UBI becomes a reality. The good news is that more and more people are thinking about exactly these questions. Six hundred of them met up in St. Louis in June 2018 for the New Economy Coalition’s CommonBound conference. This summit, which happens every two years, brought together leaders within the new economy movement (more often called the solidarity economy or the social economy outside the US) including those working on cooperatives, community land trusts, non-extractive finance, energy democracy and participatory budgeting. The conservative movement provides a kind of blueprint. While it may seem like the right wing takeover of the economy happened overnight, it’s actually been a multi-decade movement involving a complex ecosystem of groups and strategies. For example, the conservative overhaul of the Supreme Court (continuing just this week with Trump’s nomination of Judge Brett M. Kavanaugh) is something that organized groups have been plotting since the 1980s. What will it take to advance a justice and liberation agenda with the same vigor and long-term planning? Many activists and community organizations are considering that question through networks like the New Economy Coalition, a network of more than 200 organizations in the US. At national and cross-sectoral conferences and within and across communities, groups are developing shared strategies because they know that no one organization is capable of ushering in a new economic system. It will require a much greater scale of coordination than we’ve previously achieved, taking new and bigger risks and contesting power in arenas we’ve tended to shy away from. Take policy for example. What would a new economy policy platform look like? We’ve already started work on this challenge, informed in part by recent efforts like the Movement for Black Lives platform released in 2016. At the municipal-level, we’ve seen a number of significant developments in recent years including the rapid growth of participatory budgeting experiments across the US, and cities like New York which are investing millions of public dollars into the expansion of community land trusts. Nationally, there has been some positive momentum despite the adverse political conditions. In June 2018 a bill supporting worker ownership passed in the US Senate. This legislation will provide financial vehicles and significant incentives to help small businesses transition to employee-owned companies or cooperatives. A companion bill passed the US House in May and is expected to be signed into law soon. It remains to be seen whether the Preston model and its introduction in the Labour party platform will transform the UK’s economy at the scale many activists hope. Perhaps the same can be said about what’s happening in Buffalo and many other places in the USA. At CommonBound, Preston and Buffalo came together in a workshop about building bottom-up power to change the economic system. Hearing these and so many other stories, it’s hard to deny that momentum is building around the ideas and values of a new economy. Backed by grassroots organizing, this constitutes a legitimate cause for hope.